I have heard about Reddit’s AMA’s (ask me anything) for some time. I always thought that they were for famous people but for reasons not known, I am hosting an AMA for the subreddit /Canadapolitics on Wednesday, November 11, from 2- 3 PM. With the new Liberal government promising that the 2015 election would be the last one using first past the post, this AMA will be on electoral reform. But it’s also billed as a chance to ask about citizen engagement (and citizens’ assemblies), both subjects on which I’m keen. Stop by — virtually speaking– and feel free to well, ask me anything. Post Script: That was very fun. I appreciated the thoughtful and high quality questions. I will continue to check the page so feel free to join the conversation. The AMA is here. 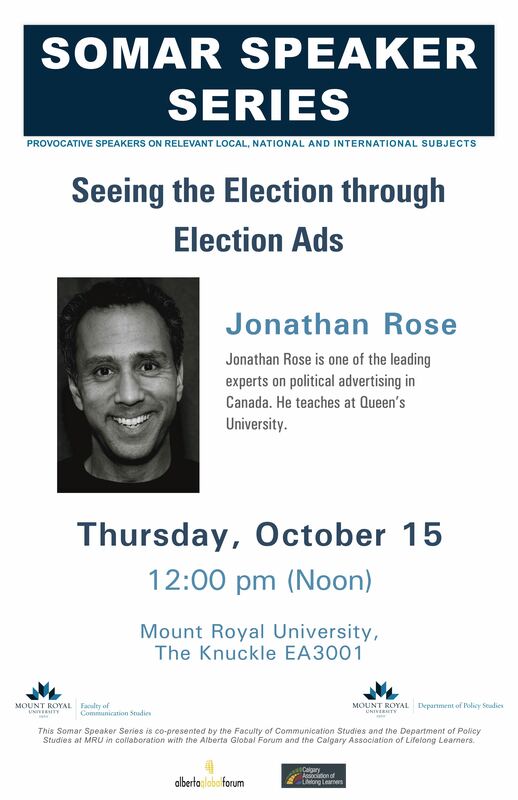 I’m looking forward to giving two talks this week in Calgary on the role of election ads. I’ll be at University of Calgary on Wednesday, October 14 as part of the CMF Speaker Series and Mount Royal University on Thursday, October 16, as part of the SOMAR Speakers Series. If you are near by, stop by and say hi — or come by and heckle. Earlier this week, a remarkable photograph changed the nature of the Canadian election campaign. The death of a two year old boy, Alan Kurdi, whose body was washed up on a beach became a symbol of Canada’s inability or reluctance to deal with the Syrian refugee problem. Up to this point in the election, the economy was seen as the ballot question. Each party was trying to persuade voters that it would be the best manager of the economy. The recent GDP data were the subject of much hand wringing and debate. Were we in a technical recession or not? If so, what does that mean for which party should be entrusted to manage it? All this changed on September 3 when newspapers around the world (like the Times of London, Washington Post) led with the same story of a family whose attempt to leave Syria resulted in the death of two children and their mother. The largest circulation paper in Canada, The cover of the Toronto Star, on the left, led with a variant of the Globe’s picture, on the right. Toronto Star, September 3, 2015. These images are great examples of how quickly a photograph can set the policy agenda both for the media, who saw the importance of the issue as reflected in their front pages, as well as the public for whom the issue may become a ballot box question. 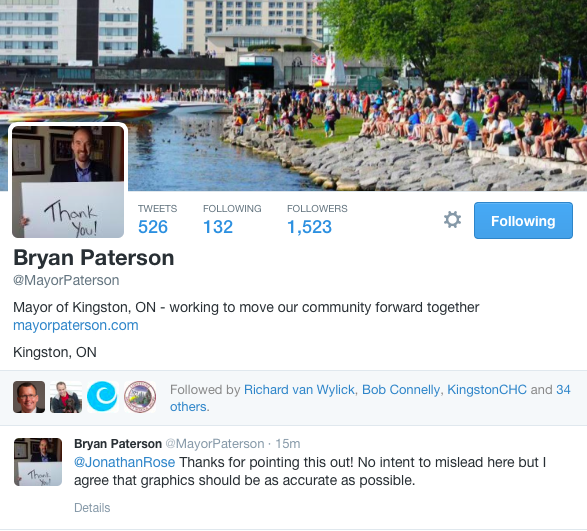 There are other notable examples of a photo changing the course of a policy. In 1993, at the height of yet another famine in Sudan, Kevin Carter took a photo that would change the course of famine as an important humanitarian issue as well as his lif e. (Carter committed suicide months after he won the Pulitizer price for the photo). The famous photo of Phan Thi Kim Phuc running from a U.S. napalm bombing in Viet Nam also served to change the course of the Viet Nam war. Interestingly, as the photo from the New York Daily News on the right shows, while it was newsworthy, the photo still was secondary to domestic politics. In 1989, during the Tiananmen Square uprising in Beijing, a lone solitary figure stood for both individual rights and freedom. So called ‘tank man‘, the anonymous young man who defied the government by standing in front of tanks became emblematic of that conflict: the lone, unarmed solitary figure standing up to an oppressive state. What all these have in common is that one photo stands for the complexity of a policy issue that until the time the time of publication did not have traction in the public imagination. These images in the words of Susan Sontag are “inexhaustible invitations to deduction, speculation and fantasy”. The invite us to wonder what is at work and how we got to this place. As such, they are snapshots frozen in time but also invite us to speculate on the history that led to that instant. Why is a girl running naked? What would motivate a man to stand in front of a tank? All are notable because they ring of authenticity and appear not staged. They seem to capture a moment in time with the photographer merely a solitary witness to an event. But of course, they are successful because of the photo’s composition and construction. Great photos like these are about selection and reduction. The choice of image and the elements within are integral to their meaning. 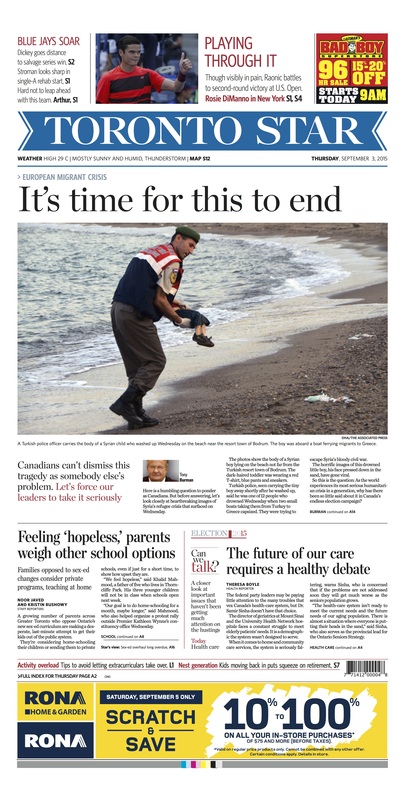 I would argue that the Globe and Mail’s photo is more effective than the one used in the Toronto Star, UK Times or Washington Post because of the selection of the stark image of young Alan Kurdi on the beach instead of in a police officer’s arms. In the latter, we can imagine Alan is being saved or is being protected. 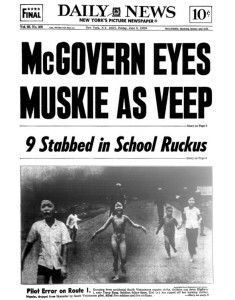 In the Globe‘s picture, no such inference can be imagined. Death is obvious and the innocence of that death is magnified by the elements of the photo such as the velcro shoes and the hint of a cartoon (or is is picture of a superhero?) on his shorts. The discussion by the Conservatives is that the complexity of the Syrian refugees cannot be reduced to one single picture. And they may be right. But these photographs, through an emotive and compelling visual that sears in our brain, are far more persuasive than any logical argument. This effect is what Roland Barthes called punctum which according to Kasia Houlian is “an intensely private meaning that is suddenly recognized and consequently remembered.” It’s not about the image; it’s about what image does to you. The photo of young Alan has an agenda setting function by putting the plight of Syrian refugees on the public agenda. And because of that, the public will now judge leaders on their capacity to respond to those issues they deem important which now includes our refugee policy. Such a powerful image will not be mitigated by logical appeals or statistics. The best that the government can can hope for is that come voting day, the policy agenda has moved on. So, this is not about political science, the federal election or university teaching. It is about something that has been consuming probably too much of my time these days: baseball. 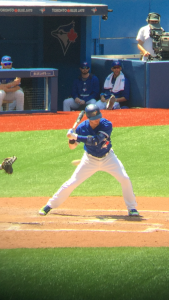 This weekend, the Jays played the LA Angels and scored more runs (36) in a three game series than they ever have in a three game series (on days that end in Y). This got me thinking of the importance of run differential which according to Victor Mather, of the New York Times, is a key indicator of success. Writing two weeks ago, he predicted the Jays’ record should be .588 instead of .495 they had in early August. This just made things a lot more interesting. Data can be presented in a number of different ways and tables with their arrays of numbers often hide the real story. The recent explosion of infographics suggests that perhaps people understand complex data when portrayed visually. Edward R. Tufte, in The Visual Display of Quantitative Information, and other works, shows how powerful data can be when portrayed well. Source: City of KIngston, 2015 Property Tax Information. The problem with this chart is that it’s deceptive. 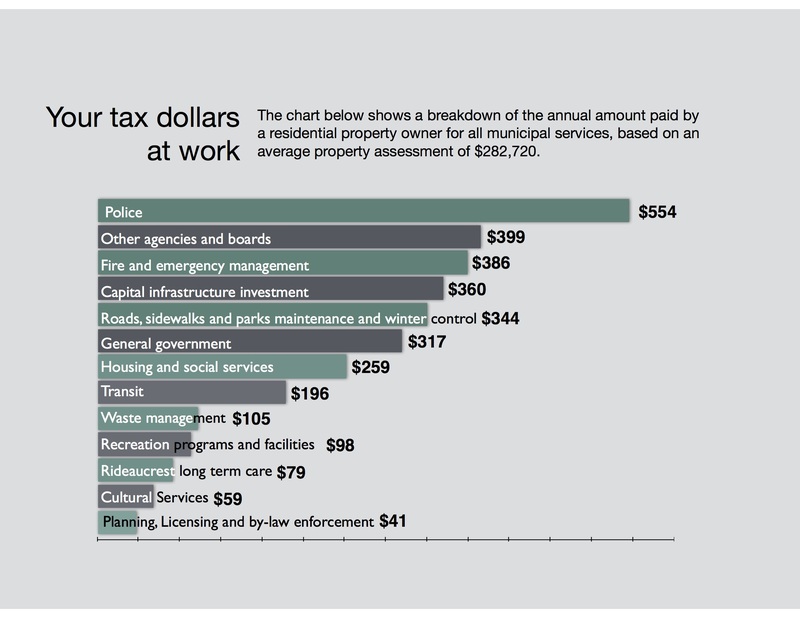 Depending on your perspective, it either exaggerates the amount spent on such things small expenditures such as cultural services or dilutes the single largest expense of the city, the police. 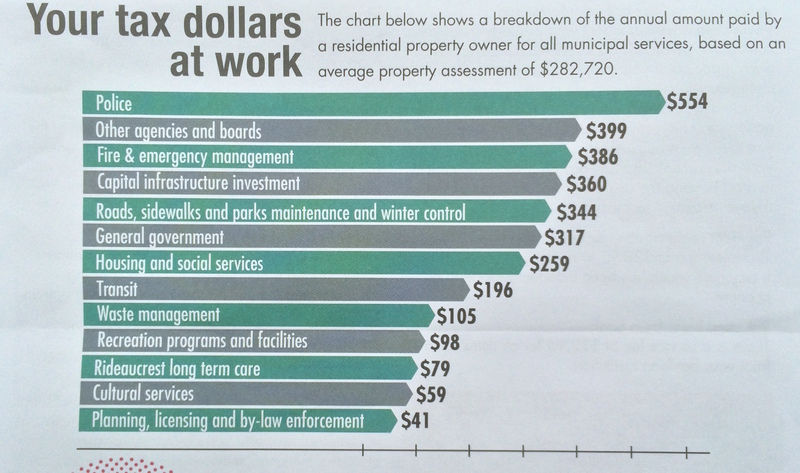 The numbers are accurate but the visual seems to suggest a greater equality than there actually is. 2015 City of Kingston Tax Expenditures, Corrected. Even taking into account my limited graphic design skills, it’s pretty clear how the data from the City take on a completely new meaning. I’m not going to infer any intention in this misrepresentation but wonder whether this misleading graphic is by design or accident. I think the city is confused again. What they really meant is that the axis is in six increments like I have shown below. The problem is that they have filled in the X Axis from -500 to 0 — likely to make it more readable. (Imagine the chart below with the green and grey covering the words and you have what they did.) In doing so, they have completely distorted the very data they meant to present and went against some very basic statistical principles. 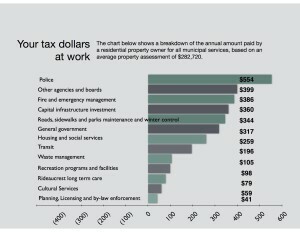 I have no doubt that city public servants are, like the rest of us, overworked and occasionally make errors. I don’t fault them for that. 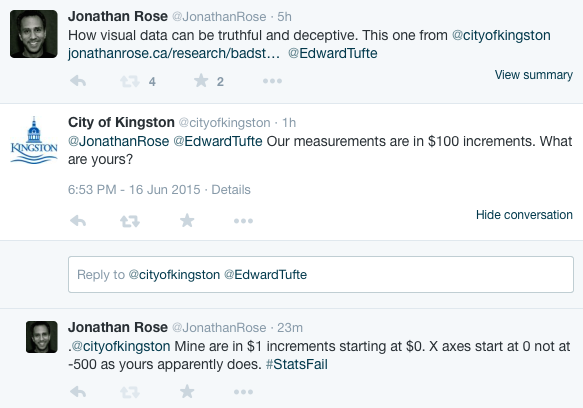 What surprises me is that the city does not understand what my undergrad students should know about basic statistics. Maybe in the future, I will give my students these data and ask them to present them in more a meaningful and truthful way. I’d be curious to see what they come up with. Post Script: This post discusses how the axis on a graph can be used to deceive. While I am prepared to believe that this was an honest mistake, in other cases the intention is much less clear. Take for example the ideological think tank, the Fraser Institute, which is given charitable status because they are engaged in ‘education’. 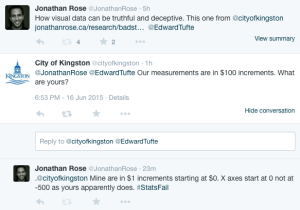 What happens when they present data that furthers their ideological agenda and is clearly deceptive? Check out a blog post by Joey Devilla to see how egregious that deception can be. I was thrilled to hear that a book I co-authored along with my colleagues, Patrick Fournier, Henk Vanderkolk, R. Kenneth Carty, and André Blais was the recipient of the Seymour Martin Lipset Award for the Best Book from the Canadian Politics section of the American Political Science Association. 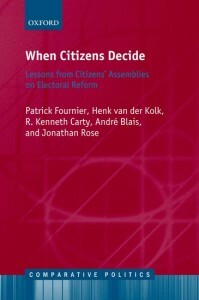 The book is called When Citizens Decide: Lessons From Citizen Assemblies on Electoral Reform. The Seymour Martin Lipset Best Book Award “is given to honor a significant contemporary contribution to the scholarship on Canadian politics, or Canada in a comparative perspective, or a comparative analysis of Canada with other countries, particularly the United States.” It will be given at APSA’s meeting in San Francisco in September 2015. I’m honoured to be recognized in the company of such impressive colleagues and happy that the book is contributing to a conversation about the role of deliberative bodies in a democracy. 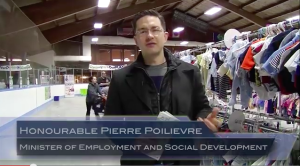 Recently, The Globe and Mail reported that Pierre Poilievre’s department paid civil servants overtime to produce feel-good ads about the Universal Child Care Benefit. The problem with this ad, like all the federal ads, is that they are beyond the scrutiny of parliament and therefore citizens. These youtube ads have rightly raised the ire of many who see this as a blatant use of taxpayer’s money for partisan purposes. This government, and governments of all partisan stripes, like to argue that advertising is an important part of providing information to citizens. They tell us that such information is timely, important and needed. Unfortunately, because the regulations around advertising at the federal level are a patchwork of guidelines, rules and norms, it is hard to know if this claim is true. To be fair, most ads by government are non-controversial. Increasingly they don’t provide much information but are a way to drive interested viewers to a government website where the nitty gritty can be explored. If you watch most ads you will likely see a series of compelling but fleeting images, designed to draw in the viewer but really as bait to drive viewers to a government website that almost always appears in the tag line of the ad. But if people are interested in programs of the government, wouldn’t they seek out that information through a quick Google search? The government would say that the problem is that many don’t know about the benefits that they can access and on this point they might be right. What makes the Poilievre ad egregious is that, like many ads, they do not require any action on the part of the citizen. Canadians get the benefit whether they know about it or not as it’s given when you file taxes. Knowing about the Universal Child Care Benefit — the nominal justification of the ad — is irrelevant to receive the benefit. Providing information is used as a cover for governments and gives them licence to tout the governing party’s platform at taxpayer’s expense. And that, of course, is what is so irksome. 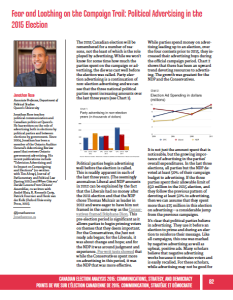 In Ontario, where the Government Advertising Act regulates advertising, the sponsoring ministry must demonstrate through polling or focus group tests that indeed, there is a need for the ad campaign. All government ads must meet certain criteria in order to be in compliance with the Act and ads cannot be partisan based on the criteria set out in the Act. Ontario is the only jurisdiction that regulates advertising in such a way. When implemented by the previous McGuinty government, it was a landmark piece of legislation designed to shine light on the regulatory practices that have existed in the shadows. It’s not perfect by any means but it is an important recognition that governments need to be accountable for the way they spend money and advertising — an increasingly important part of the communication apparatus — should be subject to the same degree of accountability. The recent proposed changes of the Act by the Wynne government dilute the purpose of the Act and reduce its oversight function. Not surprisingly, they have been strongly opposed by the Ontario Auditor General (full disclosure: I am part of the Ontario Auditor General’s advisory body that makes recommendations on government ads). After the sponsorship scandal at the federal level, government advertising practices were improved and consolidated including an annual report of the government’s expenditures that disclosed how much was spent in which departments. While the changes were steps in the right direction, they did not go far enough and the government has been very slow in posting its Annual Reports of Government Advertising. Parliamentarians, or an independent legislative officer, need to be able to scrutinize this expenditure and ask questions of it. Citizens want it and the principle of a government responsible to parliament demands it. We need to remember that during an election, expenses of parties are regulated in order to ensure principles of transparency and fairness. Parties must disclose campaign contributions and expenditures. The problem with advertising by government is that the line between party and government is blurred. Ads that should be paid for by the party are paid for by the government. And the oversight of expenditures, an important and well enshrined parliamentary principle, is non-existent. The recent ads by Pierre Poilievre are not exceptional. Should we be indignant that civil servants were paid overtime to produce the ads? Sure, but I think that misses the point. An election is a great time to see what all parties will do to regulate government advertising. I, for one, will be looking at all parties’ election platforms to see what solutions they propose. I am pleased to be the Seaker Chan Visiting Professor at Fudan University in Shanghai for May 2015. 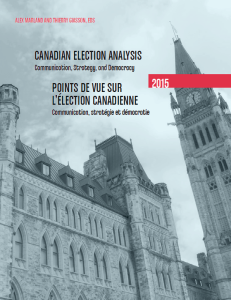 While here I will be giving lectures on Canadian politics and deliberative democracy. I will also be travelling to Chengdu to participate in a conference on local politics. I’ve always been struck at few of us disseminate our findings and work to the broader public. Clearly some scholarship (such as applied research) has more obvious connections to public problems than basic research. It is, however, still incumbent on faculty members, especially those in publicly funded universities, to explain what we do and to contribute to a civil dialogue, founded on reason and respect. Along with Canadian groups like Samara, The Crick Centre is an admirable effort to elevate our public conversation, both of which I am happy to be affiliated.